Tiger & Bunny was featured on morning TV in Japan the other day, and new footage of the movie was shown. The theme song for the movie “Linear Blue wo Kikinagara” will be performed by UNISON SQUARE GARDEN who also performed the first opening “Orion wo nazoru”. The new NEXT appearing in the movie is called Robin and he’ll be voiced by Yamaguchi Kappei. The new Cinema★Cinema magazine features Tiger & Bunny movies, and there’s information also in other new magazines on the movie. Tiger & Barnaby’s suits will be explored in more detail in the movie. Sky High, Origami, and Blue Rose’s suit gimmicks will also get some attention. The scenes concerning T&B’s suits are somewhat prominent. The way the other heroes interacted with the main pair at first will be shown. Shadowing, mouth movement, and the way eyes are drawn have been revised and made more cohesive; the old footage has been fixed accordingly. The movie’s story is based on episodes 1 and 2. From now on Nishida is not just the script writer, but the “story director”. Among other things the movie contains scenes from the first meeting between Barnaby and the other heroes. Close-up on Tomoe will be there as well. The voice recording is all done. Plenty of “behind the scenes” material; for example the way Tiger & Barnaby’s suits work and how they put them on. An interview with Hirata and Morita. 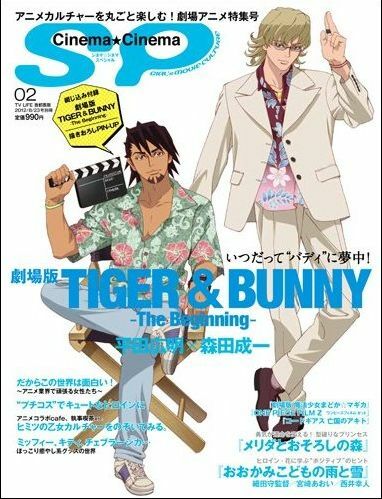 Next month’s issue will have Tiger & Bunny on the cover and it will contain a special novel. Cover, insert and a double-sided pinup. Opening special “Crazy About Partners”. Interview with director Yoshitomo Yonetani and Ozaki. Hirata and Morita talk “‘Buddy’ Only Knows”. A look back at the partner masterpiece Tiger & Bunny. Sneak peak at T&B The Live. If you experience lust for the Cinema★Cinema magazine, I found it at least at CDJapan (though their rates for magazine shipping are horrible). A new movie trailer will be available on July 7th in theaters in Japan, featuring the new song. I’m not certain if it will be available online simultaneously or if we have to wait a bit. And totally unrelated, but I got my copy of KING OF WORKS and I’ll see if I can get a review together this weekend with plenty of pics!